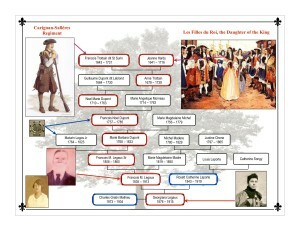 While tracing my Louisiana Creole roots beginning with my mother’s maternal line in New Orleans, I was successful in locating and documenting two of my earliest known French ancestors who arrived in Quebec, Canada in the years 1665 and 1668. 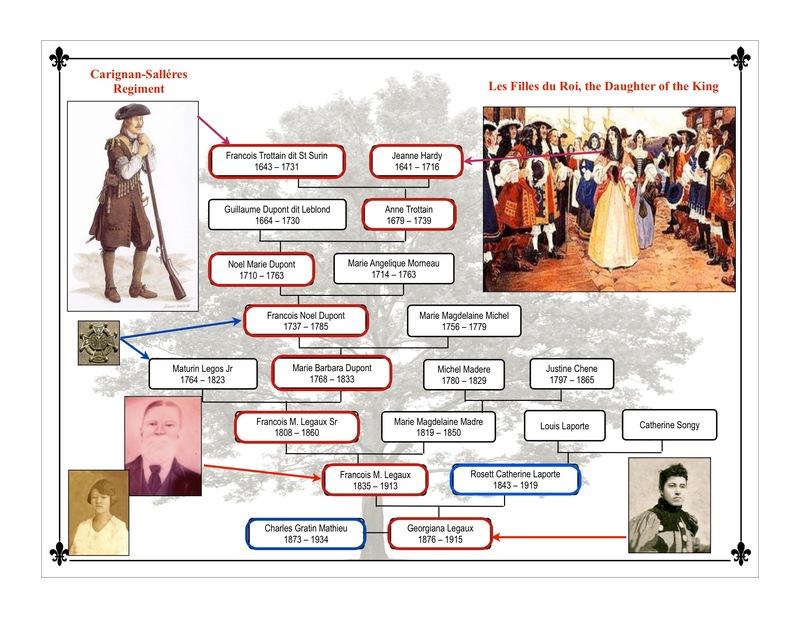 See previous blog post here of another documented discovery recorded and certified by the American-French Genealogical Society. 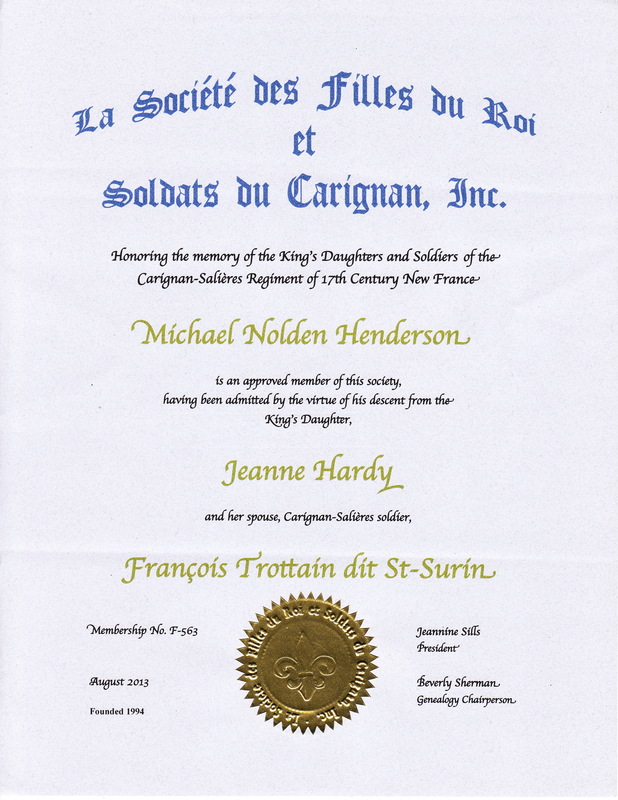 Francois Trottain dit St Surin and Jeanne Hardy are my 9th generation great grandparents. After learning that Jeanne Hardy’s husband Francois Trottain dit St Surin was a member of the first expedition of Royal troops (Carignan-Salieres Regiment) to arrived in Canada in 1665 and he would become my earliest known french military connection, I submitted an application for membership in La Société des Filles du Roi et Soldats du Carignan, Inc. My genealogy and membership was approved Aug 2013. Here below is a little bit about my discovery. The Carignan-Salieres regiment arrived in Quebec City in the summer of 1665, the first contingent arriving on Jun 18. This was the first expedition of Royal troops to Canada. The Regiment counted twenty companies and each company was made up of three officers – a captian, a lieutenant and ensign – two sergeants, three corporals, five anspenssades and forty soldiers, including at least one drummer. Four other companies drawn from the regiments of Ligniéres, Chambellé, Poitou and Orléana coming from the West Indies also came to Quebec City with Marquis de Tracy, the new governor general. Considering that the colony had about 3200 inhabitants, the arrival of some 1200 soldiers and 80 officers had an extraordinary impact on its development. A body of troops of this magnitude in Canada completely transformed what had until then been a precarious military situation for the colony. Finally, towns could be built to clock the Richelieu River, the Iroquis’ traditional route. In just a few weeks, the french went from the defensive stance that had been necessary for almost a quarter of a century to a new tactic: attacking the Iroquois on their own territory. About Francois Trottain dit St SURIN: Son of Francois Trottain and Jeanne Gripon of the Parish of St Severin of the Village of Saint Seurin-d’Uzet. Now Chenac Saint Seurin d’Uzet, 17120, near Mortagne-sur-Gironde , 17120, Charente Maritime,. Poitou Charentes (Saintonge). 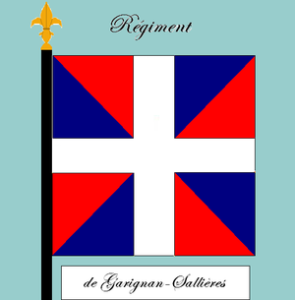 He was in the Naurois Company of the Carignam Regiment. They departed La Rochelle, France aboard the Justice on May 24 1665 and arrival in Québec City on Sept 14 1665, according Viateur Boulet / Bosher /. François Trottain become Trottier according to the census of 1681, was a carpenter, seigneurial notary, bailiff and tax attorney Batiscan. He was said to also have been royal notary and keep notes Cap-de-la-Madeleine, Champlain, Batiscan and Sainte-Anne. Probably he never received his commission as royal notary, but the authorities allowed the seigneurial notary conscientious, appropriating this imposing title. Jeanne Hardy died April 5, 1716 in Batiscan. François Trottain died on February 9 and was buried Feb. 11, 1731. (Died August 9, 1731 for Landry)? Household established in Batiscan. (5 children). There is more, Please see here.